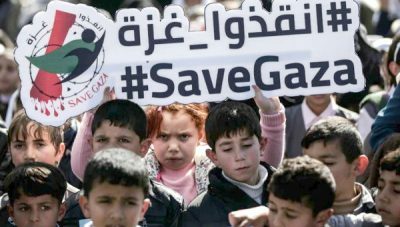 On Wednesday, Israel carried out a 24-hour, round-the-clock military assault on Gaza, one of the most densely populated places on earth, killing at least three Palestinians, including a 23-year-old pregnant mother and her 18-month-old daughter. Images of the young family’s blood splattered home trickled out onto the Internet, but that’s pretty much where much of the media’s reporting of Israel’s latest effort to ramp up its most recent and ongoing siege of the embattled Palestinian enclave started and ended. Not a single mainstream television network in the United States carried any mention of Israel’s barrage of 140 bombs and missiles directed at Gaza on Wednesday, which came on the back of a sustained Israeli effort to break the will of Palestinian resistance since the Great Return March began more than four months ago. Since March 30, Israel has killed more than 150 unarmed Palestinian protesters, alongside a number of slain medics and journalists in Gaza. According to Palestinian health officials, more than 16,000 have been wounded. On the odd occasion Western media outlets do factually report Israel’s indiscriminate and intentional use of violent force to murder Palestinians, it’s typically followed by either a story that “balances” out a “both sides” narrative, usually involving comments from an Israeli spokesperson or military commander, or the original report is edited in a way that suggests the original story hadn’t passed the desk of Israeli government censors. Hamas, the product of Israeli creation, is again being used as a fig leaf by Israel to ‘justify’ its 70-year long ongoing effort to ethnically cleanse Palestine of the Palestinian people, while the US media goes along for the ride, echoing both Israel and the Trump administration’s propaganda. The near-total blackout of coverage on Israel’s air assault on Gaza this week in the US media speaks to something even more sinister, however. What television networks chose to cover reflects both the preferences of producers and the interests of their respective audiences. Networks are driven by a single motive: profit, which is driven by ratings. In choosing not to cover Israel’s latest round of unjustifiable violence against the Palestinian people, American audiences are conveying to their most watched news programs that they care not one iota for Palestinian lives. And that, right there, is the most damning indictment of all!